You know, 2012 was a good year for me in gaming, especially for puzzle gaming--which I love. We started off the year with English Country Tune in February, which carried me through many months. Just months later in April, I got Fez, which speaks directly to me in the way it had me piece together puzzles from all over. 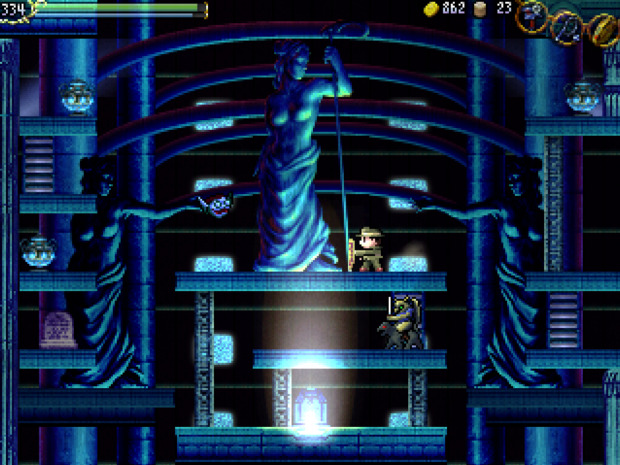 When Destructoid reviewed the La-Mulana remake, it caught my eye right from the first line: "Wow. This is beyond a doubt the hardest game I've ever played." What they went on to describe kept reminding me of Fez, enough so that when I finally finished off The Last Express, this one had shuffled its way right to the top of the list, so I grabbed it from GOG. What did I find? Simply put, a masterpiece. The puzzles in this game are incredible. They are cryptic clues that you have to piece together between rooms that are at opposite corners of the map, which you encounter hours apart. Progress such as beating a boss triggers subtle changes in disparate areas. It demands extensive revisiting and huge amounts of comparison between clues, room names, mural descriptions, and seemingly inconsequential art details. Having already read the Destructoid review, I was kind of ready for this, so I planned right from the start to take meticulous notes. Those notes saved my--well, Lemeza's--life, and, as ridiculous as may I look with my incessant copying and pasting, I regret nothing. As a side note, the notes are kind of a big deal for me. By the end of my playthrough, I now have a notebook that easily rivals the La-Mulana wiki. Sure, the wiki has more pure facts about the game, but I have annotated a ton of the clues in mine with the meaning behind them. When you see a cryptic clue about "a lone snake standing among spikes," I've written down what that means and pointed out the related clues needed to solve that puzzle; the wiki often just says, "go here and stand on the doodleybob." The best part about this notebook of mine is that, thanks to the powers of TECHNOLOGY, I can easily share it online. Help yourself: take a look at my book of La-Mulana. As I'm wont to do these days, I streamed the majority of my playthrough. This was a very good move on my part, because I could not have beaten it myself. That thing about it being ridiculously hard? That's actually true. Whereas I absolutely demolished Fez in a few solid days of playing, some of the puzzles in this are so far flung that my weak sense of imagination and literal sensibilities wouldn't have been able to crack the metaphors. As such, I was really, really lucky to have a small cadre of awesome viewers who also had a mind for these kinds of puzzles. Well, not only that, they had the angelic patience to sit as I took and edited all those screenshots, wrote down all those notes, and did other boring, non-gamey stuff. When I finally beat the game last night, clocking in at 39 hours, 10 minutes, and 55 seconds, I hope all of them shared the same sense of accomplishment that I did. I may have been going through the motions, but by far I wasn't the only one getting those desirable "AHA!" moments. Speaking of that eureka factor, I think the blind playthrough of the game is really valuable. I've been watching some YouTube videos of Let's Plays of the game, and the ones where the caster already knows the solutions to the puzzles are just... boring. They're just going through the motions. I mean, I guess there's some difficulty in the bosses: they're huge, deal a ton of damage, and your weapons are embarrassingly short, so that's kind of a pain. But for me, that's not the real draw. If it were, I would just play Castlevania, because that's basically what the gamplay is, and not even as polished. What I'm looking for is how people actually crack the puzzles, and that never shows up on the video. It's always: "hmm, I don't know what to do here. Let me go figure this out off-stream." --cut-- "OK, I'm back! I figured it out: I have to stand on the shamblargo!" Yeah, but how did you figure it out? Or did you look it up? That temptation is always looming. But the story, art, and settings are beautiful and amazingly done. 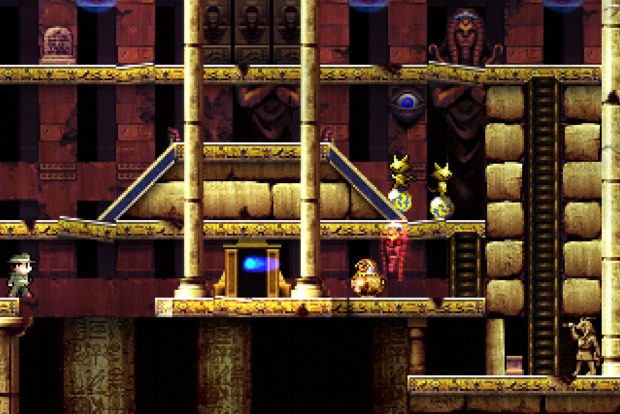 The premise of the story is that the La-Mulana ruins are supposed to be the birthplace of mankind, so you see representations of pretty much all ancient civilizations in the different dungeons: Greek, Indian, Egyptian, Mesopotamian, Persian, and so on. Developing on this, a lot of the murals and depictions of the gods and guardians are taken from real mythology. In the Mesopotamian section, you have to fight a number of ancient creatures. One of the viewers looked up their names, and their appearance in-game was accurate. That's an striking detail that I don't feel like I see in a lot of games. I think this game falls into a genre where the art is actually very important to the gameplay, too. I watched some videos of the original version, and I have to say, the newer one should be considered the "definitive" one, due to its updated art. In the old game, the art was simplistic--dare I say crude--and striking. For a game that bases so many of its clues on subtlety, this is a detriment. A mural in the background in the old game would have a harsh, incredibly distinct depiction, but in the new game could have details not immediately obvious without close inspection. The story, though scattered in the wind and available only in scraps for a long time, slowly comes together like a good mystery book. By the end, you'll know so much about the history of the ruins, their purpose, and the various parties involved. The story has an end, and one that I can walk away from without looking back. They absolutely nailed it. The quality of the writing is really surprising to me. 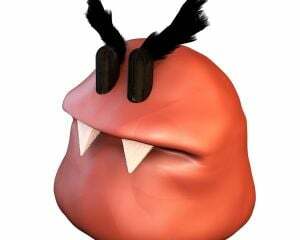 Nigoro and GR3 Project are Japanese developers. They're very Japanese. I read through the game's manual, and it reads like it was run through an online translator; it's atrocious! But somehow, the writing in the game is pitch-perfect, with almost no faults that I can detect. If you've gotten the sense for how much I've gone on about the puzzles, you'll understand why that is so crucial for this game. The subtlety of language factors into the clues strongly; without excellent translation, all hope is lost. What else to say? This was an amazing journey for me and Lemeza. My buddies in the stream were so helpful that they deserve a mention: primarily Rekkenber, Overlordegg, Km_Shinkiro, Avalander, and Cabch. A+ WOULD ARCHAEOLOG AGAIN.